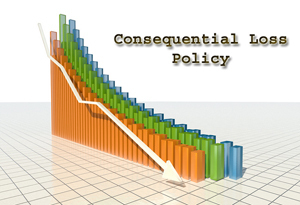 Consequential Loss Policy - Corporate Risks India Insurance Brokers Pvt. Ltd. Consequential Loss Policy also known as Business Interruption Policy is taken to cover potential loss of profit or revenue from business in case of reduction in production following damage to the insured property. This policy is taken as an extension of Fire Insurance Policy (Standard Fire and Special Perils Insurance Policy) or Machinery Breakdown Policy. This policy should be taken by all Organizations whether large or SME to protect their Financial Loss due to interruption in business following damage to its property. Consequential Loss Policy covers the following financial losses. Financial Losses arising out of following expenses can also be taken as add-on covers in the Consequential Loss Policy. How to select Sum Insured in Consequential Loss Policy? Sum Insured in Consequential Loss Policy should be an estimate of Loss of Gross Profit for the period that company anticipates to get its operations back to normal. This period starts from the day the damage to the property has taken place. The maximum period of indemnity in Consequential Loss Policy would be 3 years. How to Claim in Consequential Loss Policy? Once the company has incurred an admissible financial loss due to a peril covered under Fire Insurance Policy (Standard Fire and Special Perils Insurance Policy) then the company can file a claim under Consequential Loss Policy. If there is a reduction in turnover due to Fire Loss then the Insured should immediately register a claim under Consequential Loss Policy with Insurance Company.